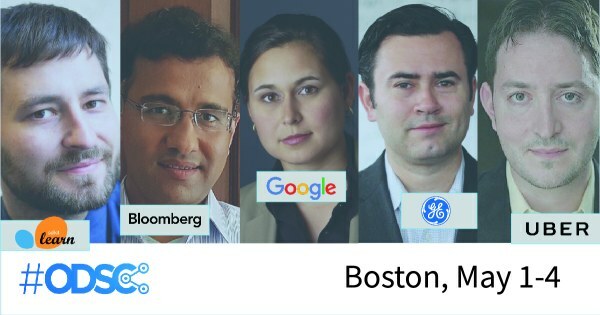 Open Data Science Conference just released 80% of their schedule and the first round of speakers for ODSC East 2018 in Boston, May 1-4. Learn, train and engage with 200+ world class experts. Save 50% with code KDNUGGETS. Open Data Science Conference just released 80% of their schedule and the first round of speakers for ODSC East 2018. See the dates, times and topics ODSC’s incredible speakers will be covering. Learn, train and engage with 200+ world class experts on machine learning, deep learning, data visualization, data management, predictive analytics, artificial intelligence and more. Save 50% with code KDNUGGETS before prices increase substantially at midnight on Friday March 2nd.